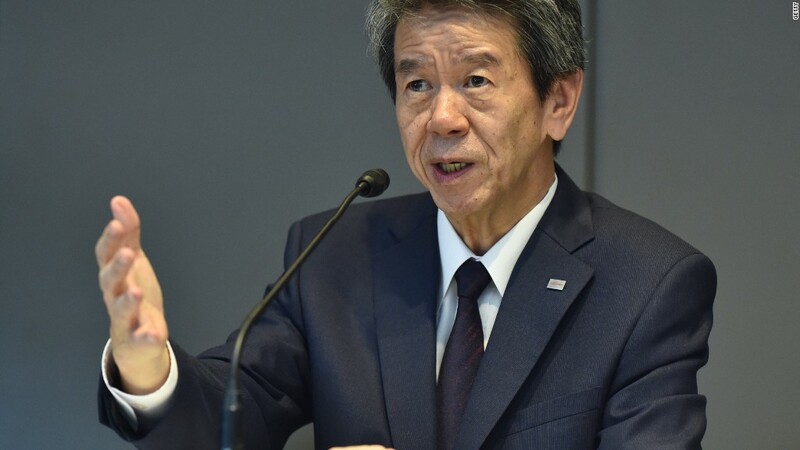 Toshiba's chief executive and president Hisao Tanaka resigned Tuesday over an accounting scandal that has rocked the company. Eight board members, including vice chairman Norio Sasaki, have also resigned their posts as part of a major management reshuffle. Toshiba's current chairman, Masashi Muromachi, was named interim president. Japanese conglomerate Toshiba (TOSBF), which makes everything from consumer electronics to nuclear energy technology, has been under fire for months over accounting irregularities. The company overstated profits by 151.8 billion yen ($1.2 billion) over a seven year period, according to an independent committee. "We are taking what has happened very seriously and we would like to apologize from our hearts to, starting with the shareholders, and to all the stakeholders," Tanaka said at a news conference, announcing his resignation. The company said in a letter to investors Monday that it would "take procedures to correct past financial results as necessary." Shares of Toshiba have dropped around 20% since early April when the accounting issues came to light. The company's market value is hovering around 1.673 trillion yen ($13.4 billion). Full-year earnings are due on August 31, and analysts at Bernstein expect Toshiba's stock to continue to drop.